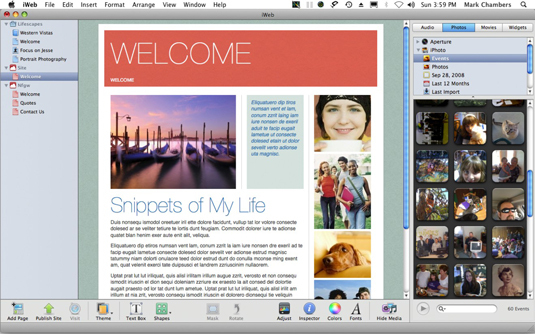 Mac OS X Snow Leopard includes the iWeb application to make creating a Web site easy. All of iWeb’s features and controls fit into a single window. From the main iWeb window, you can build your Web pages, edit their layout, and organize your Web site. The iWeb window holds everything you need to put your mark on the Web. Toolbar: Located at the bottom of the window, the iWeb toolbar keeps all your major controls one or two clicks away. The iWeb toolbar contains different buttons, depending on the chore you’re handling at the moment. Layout: You need elbow room to build a Web page, so the Layout section of the iWeb interface dominates the window. You create and edit your pages in the Layout display and then use it to preview and test-drive your finished site. Site Organizer: The strip to the left of the layout display is the Site Organizer, which allows you to organize your Web sites, add new pages to a site, and select an existing page for editing. Decide which pages you need. Create a new site and build those pages. Publish your site to your MobileMe account (or to a Web server using FTP).